Want RFID? Not Sure How to Get Started? - Iteam Resources Inc.
Home / Fee and Fine Payment / Want RFID? Not Sure How to Get Started? Not sure if your library is ready to make the switch to RFID? D-Tech’s RFIQ System provides perimeter-based library material protection while laying a migration path for full RFID capability. Where traditional EM or RF security systems are inappropriate, RFIQ intends to fill the gap. 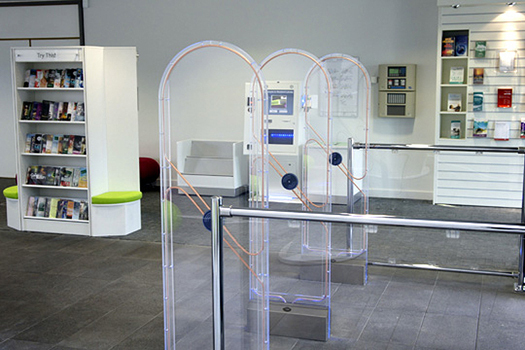 The D-Tech RFIQ security gates and tags allow a library to invest in more up-to-date technology affordably and promise very high detection and no false alarms. D-Tech’s RFIQ tags cost less than EM strips or RF book tags yet are fully compatible with RFID when you’re ready to expand to all the benefits RFID offers. Ongoing costs are lower, too. The RFIQ Security Antennas can be packaged in a Plexiglas frame with a durable stainless steel base, or in metal looped antennas with a colored metal base. The RFIQ antenna system provides a visual deterrent with an unintrusive design.